Here's a wonderfully quirky way of getting writers in print - stories on a book store till receipt! 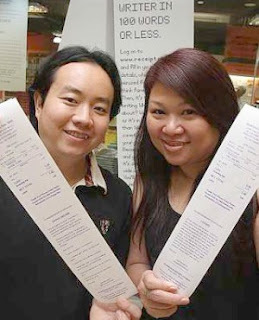 BookXcess is inviting 100-word entries for its "receipt stories" - check out the website Jackie Ng and Andrew Yap (left) have set up to read some examples and submit your own. The discount bookstore is going from strength to strength - last year alone they sold 200,000 books - so there's whole lot of reading going on in this city! i went there yesterday and bought 8 books....great! !